Why pay dealership prices that are marked up 100% when you can purchase EBC high-quality RK Series Premium OE Replacement rotors for less? Unlike cheaper, inferior replacement rotors that may look identical to original equipment, EBC builds these to match original factory dimensions and machines them to extremely tight tolerances. But they did not stop there. EBC has applied their engineering expertise to create an iron compound that exceeds the quality of most original material blends, so these rotors actually improve on factory levels of heat buildup, brake noise, vibration, and wear. A higher percentage of carbon and silicone is present which leads to the formation of graphite during the curing process. When graphite is present, the rotor itself takes on qualities of a denser, softer material. Heat is more evenly dispersed to reduce warping, cracks are less likely, and vibration-related noise is greatly reduced. RK Series Premium OE Replacement Rotor Kit is anodized for corrosion resistance, and rotors should be fully ready for performance driving after a 500 mile break-in period. The world-renowned brake experts at EBC have developed over a dozen variations of , and each one is crafted to provide a superior level of grip, wear, and performance for uniquely different vehicle sizes, weights, and applications. When the company engineers who created pads that can survive 1,800 degree temperature test runs turn their attention to creating equally impressive brake rotors, you will see rotors finely tuned to deliver impressive looks behind your wheel spokes and last run performance that’s as equally impressive as your first. If you’ve been let down by underperforming brake rotors that didn’t last as long as they should, RK Series Premium OE Replacement Rotor kit is designed for the long run. If installed at the same time as a new set of , it’s not uncommon for these rotors to last the length of the first set with more than enough life to be used with a second set. All EBC brake rotors are cast to a high metal strength rating of 150 newton meters and are precision CNC machined to be within tolerances of less than 0.05 millimeters. RK Series Premium OE Replacement Rotor Kit is the result of relentless testing and refinement, and when better brake rotors are built it is EBC that will build them. 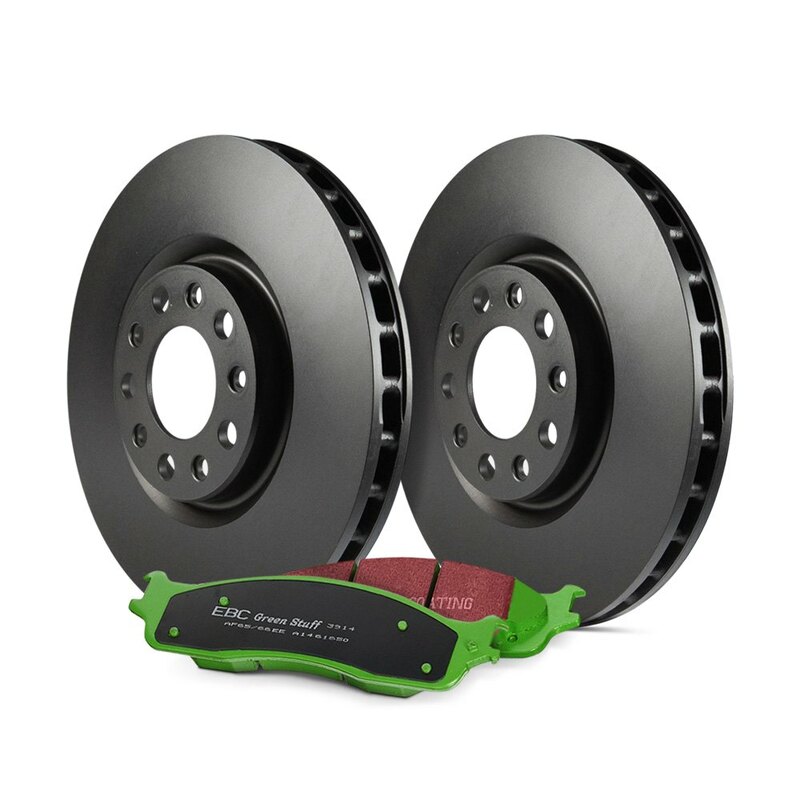 For heavier pickup trucks and sport utility vehicles, EBC offers the Greenstuff 6000 Series Truck and SUV Brake Pads to give you longer pad life, low rotor wear, and reduced brake dust. Instead of neck-breaking autobahn grip, Greenstuff 6000 pads are formulated for the unique needs of heavier trucks and sport utilities that venture off-road. Unlike factory original semi-metallic pads, these are constructed from an organic aramid compound which blends Kevlar and Twaron composites to create a harder pad surface that is extremely resistant to dirt, rocks, and sand. While that harder brake pad surface takes longer to wear down, the improved pad life will not come at the expense of . Because steel wool compounds are pared to minimum levels, you will find a new set of rotors will last through two sets of brake pads. Should you install new pads without replacing rotors, pre-chamfered pad edges will mate perfectly against the grooves and lips that normally form on the rotor surfaces, so the meat of the pad makes contact against the rotor center where it counts. These pads also feature a red top layer coating designed to scour glaze and hot spots off worn brake rotors during the break-in process. As it does that, the coating also serves to provide a higher level of grip to counteract low friction levels that exist before bedding is complete. Built-in shims ensure any high-frequency vibration is absorbed rather than transferred as squealing noise, even under the most extreme weather conditions. In government R90 tests of replacement brake components, EBC Greenstuff pads have been shown to deliver equivalent performance, bedding, cold temperature operation, and speed sensitivity versus original manufacturer parts. patented Greenstuff brake pad material also ensures the pads are soft enough to avoid brake squeal, but not so soft that longevity becomes compromised. Built-in shims ensure any high-frequency vibration is absorbed to prevent squealing even under the most extreme weather conditions.